Looking for an easy and affordable gift option this festive season? Look no further! There’s always one person we struggle to buy for at Christmas and it’s usually the woman who has everything. Why not give the gift of relaxation with a jar of stress-relieving bath salts? Here we look at five simple DIY recipes that are quick and easy to put together. Mixing sweet and floral scents together, this recipe is ideal for girly girls. Mix a cup of Epsom salt with petals from one rose and a couple of drops of vanilla fragrance oil. Put the mixture into a food processor and blitz for a few minutes. Reminisce about sunnier days with this summer-inspired recipe. Add some strawberry fragrance oil to your Epsom salt and pop in a couple of drops of red food colouring (optional) for a pretty pink colour. Well known for its anti-stress properties, lavender is the perfect scent for encouraging relaxation. 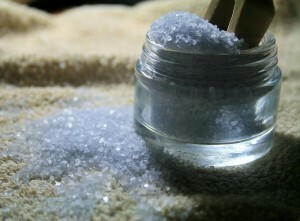 Add some lavender essential oil to your bath salts and some red and blue food colouring to get a purple hue. You could even add sprigs of dried lavender to the mix. This scent is uplifting so is great for tackling winter blues. Add some lemon essential oil to your salt and pop in a few slices of dried lemon. Yellow food colouring adds a touch of sunshine. One of our favourite scents here at BR, roses make a beautiful addition to any bath. Simply combine your Epsom salt with a cup of dried rose petals, rosewater/rose essential oil, baking soda and powdered milk. Want to treat your friend/family member even more? An aromatherapy massage could be just the ticket. Use our search tool to find a masseuse in your area and ask about gift certificates.